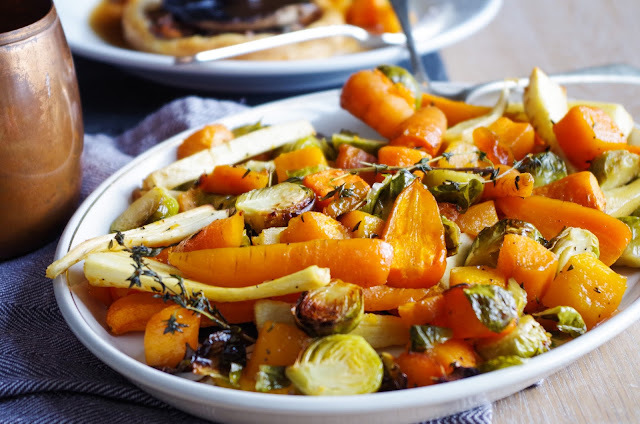 If you've seen my previous post, then you'd know this recipe was coming, along with a secret ingredient that makes the most incredible roasted veg ever. I've made whiskey roasted carrots before and I'm sure you've all seen plenty of recipes for cinnamon glazed veg online...but what if you combined them? 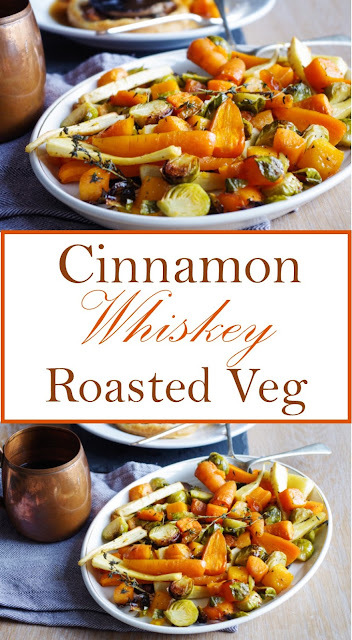 So, I was talking to my mum and full disclosure, she came up with the genius idea of using her new favourite drink Jack Daniels Fire - for those not in the know, this is cinnamon whiskey - to roast veg! 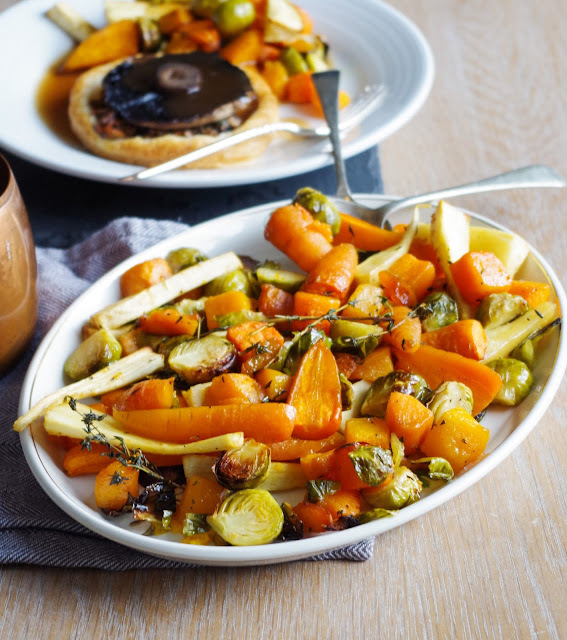 So, there you have it, the secret ingredient to this amazing roast veg is Cinnamon Whiskey! 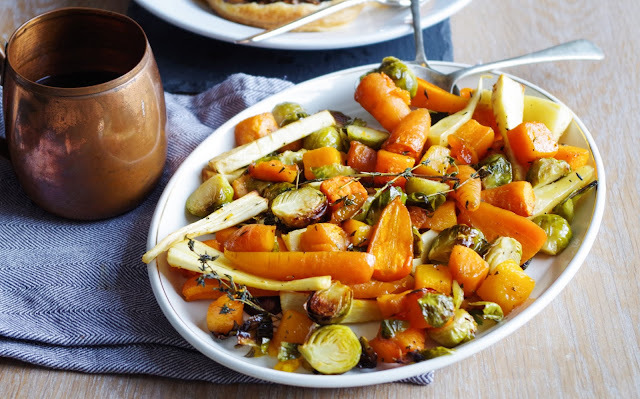 The hint of cinnamon, combined with the sweet acidity of the whiskey, a drizzle of maple syrup, olive oil, fresh thyme and a good pinch of salt just makes this roasted root veg the best you've probably ever tasted. The veg is tender, with a little bite still to it, the veg is all perfectly glazed, with some crispy caramelised pieces from the edge of the pan. I used carrots, parsnips, butter nut squash, sweet potato and Brussels sprouts - which tend to get a bad rep, but sprouts are clearly not meant to be boiled and it's almost like they're getting their revenge by tasting horrible to anyone who has the audacity to boil them. I promise you, once you've tried, sweet spiced, caramelised sprouts, you'll never even consider boiling them again! This side dish of veg is perfect for Christmas, Thanksgiving, Sunday roasts or even as a midweek meal - it goes perfectly with any main you'd serve up with a roast - pies, tarts, nut roasts and of course, crispy, perfect roast potatoes. Peel and chop a small sweet potato and 1/2 butter nut squash into 2cm chunks (~100g each), Peel 2 parsnips, chop in half and then into equal sized 'chips'. Remove the stem of the baby carrots and chop the bigger ones in half length-ways. 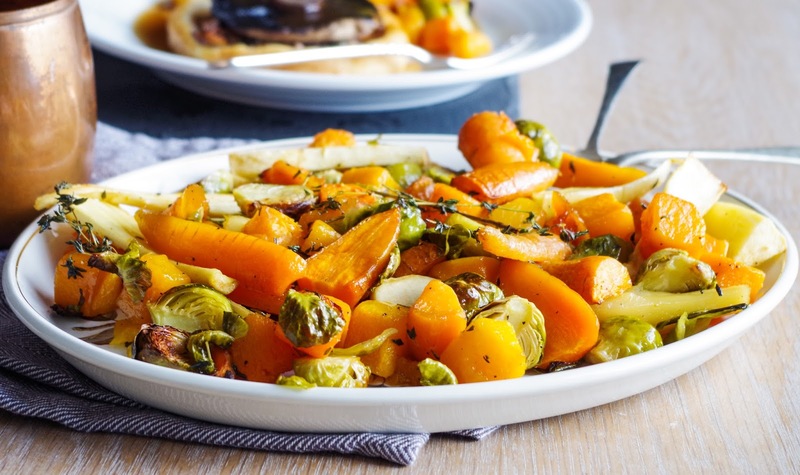 Cut the sprouts in half and place all veg in a large baking dish. Drizzle with olive oil, add in the whole thyme sprigs, drizzle with maple syrup and pour in the cinnamon whiskey and a generous pinch of salt. Toss the veg to coat evenly and place in the oven for 20 minutes. After 20 minutes, mix the veg up, so they cook evenly and place back in the oven for a further 30 minutes. Serve up with main of choice and enjoy!